Does Preloading With a Nicotine Patch Help Smokers Quit? Response: Tobacco addiction occurs because of repeated pairings of the act and sensation of smoking with binding of nicotine in the midbrain leading to release of dopamine in the nucleus accumbens. These repeated pairings create associative learning and, when brain nicotine concentrations fall, this produces a compulsion to keep using tobacco. In theory, blocking the actions of nicotine released while smoking ought to reverse this learning. One way to do this is to use a nicotine patch which provides a steady state high concentration of nicotine that desensitises the nicotinic receptors in the midbrain, making them unresponsive to nicotine from a smoked cigarette. This is the theory behind nicotine preloading. The clinical trial evidence that preloading works is equivocal, with some trials suggesting a very large therapeutic effect and others no benefit at all. In the light of both the promise and the uncertainty, we aimed to complete the largest trial to date of nicotine preloading to examine its effectiveness, safety, and tolerability. MedicalResearch.com: What did you do? Response: This was a pragmatic trial, meaning that it was set within a routine health service context. In this trial we referred people to the UK National Health Service Stop Smoking Service to provide treatment to support people to quit- medication for use after quit day and behavioural support starting before and continuing after quit day. It also meant that we did not use a placebo for the control group; whatever non-specific effects arose were all grist to the mill in this trial. And that context turned out to be rather crucial in explaining the pattern of results. The control group simply waited for four weeks to pass smoking normally before trying to quit. 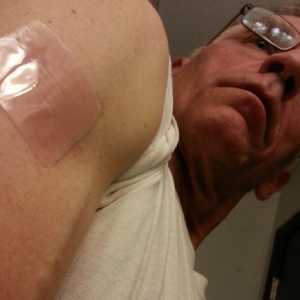 The preloading group smoked as normal for four weeks but used a 21mg nicotine patch before trying to quit smoking. MedicalResearch.com: What are the main findings? Response: The evidence on safety and tolerability were clear and unambiguous. During the period of preloading, there was no excess of serious adverse events (hospitalisation or death) in the preloading group. About 2 or 3 in a 100 people got some nausea from the preloading with 1 in 100 vomiting because of it. 1 in 100 got headaches, vivid dreams, or poor sleep, all of which are known side-effects of the patch. Overall, around 5 in 100 stopped using the patch because of side-effects, while 95 in 100 continued it. The primary outcome was six months biochemically confirmed prolonged abstinence from smoking. This was achieved by 157/899 (17.5%) participants in the preloading arm and 129/893 (14.4%) in the control arm: difference 3.0% (95% confidence interval −0.4% to 6.4%), odds ratio 1.25 (95% confidence interval 0.97 to 1.62), P=0.08 in the primary analysis. However, because people knew that they were either preloading (wearing a patch) or not (smoking as normal), this affected the standard smoking cessation treatment that followed preloading. More people in the preloading arm compared with the control arm continued with nicotine replacement therapy after quit day, while fewer used varenicline. As varenicline is more effective than nicotine replacement therapy, this affected the results. Adjusting for this effect, as pre-specified, gave an odds ratio for the effect of preloading of 1.34 (95% confidence interval 1.03 to 1.73), P=0.03: difference 3.8% (0.4% to 7.2%). This pattern was reflected in abstinence rates at 4 weeks and 12 months too. MedicalResearch.com: What should readers take away from your report? Response: Preloading is safe and tolerable, but whether it is effective or not depends upon the subsequent treatment and perhaps the guidelines that affect treatment choice. In the UK, where this study took place, our guidance advised therapists not to use nicotine replacement and varenicline simultaneously, which was necessary if a person was to preload and start varenicline. As a result, therapists were reluctant to prescribe varenicline to people who were preloading and it could be this that accounts for the difference in use. However, we do not know for sure why this difference occurred. It could have occurred because people who were happy preloading could see no advantages of swapping from nicotine replacement to varenicline. In summary, if therapists can ensure that people who preload are happy to switch to varenicline for subsequent treatment, then preloading is effective, safe, and tolerable. MedicalResearch.com: What recommendations do you have for future research as a result of this work? Response: We need to know whether using nicotine preloading deters the use of varenicline and, if so, how to prevent that happening. The mechanism of action of preloading means that all smoking cessation medications should have a preloading effect and there is preliminary evidence for this for both bupropion and varenicline. Further trials testing the effect of varenicline preloading would be helpful. MedicalResearch.com: Is there anything else you would like to add? Response: There are no significant conflicts of interest in this study. Glaxo Smith Kline donated the medication to the trial but had no role in the design, analysis, write-up, or decision to publish. Two investigators had worked with the pharmaceutical industry on topics unrelated to nicotine preloading. This entry was posted in Author Interviews, BMJ, GSK, Smoking, Tobacco, Tobacco Research and tagged medical research, nicotine patch, smoking, tobacco by Marie Benz MD FAAD. Bookmark the permalink.